A common question for publishers: "What's the cost of the photos in the last issue?". In most cases, license costs for used photos have to be calculated by hand. To solve this problem, we've created a plugin to give you an overview of all content used in a publication. Since the Elvis server automatically creates relations between archived InDesign files and used photos, it's easy to compile a clear list of content related to a publication. This plugin looks for InDesign files and for each InDesign file it finds (or issue of a publication) it will list all images that are related to it. There are two ways to open the plugin. 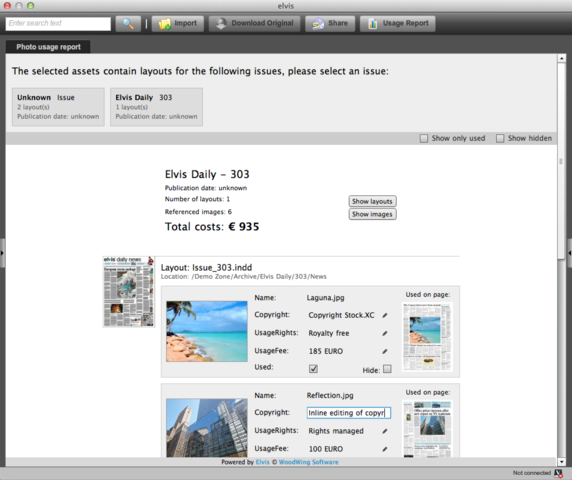 If you open the photo usage report directly, you will see all layouts available in the server in the report. You can also open the report on a selection in the search results to open the report specifically for the selected items. In the plugin you can see all images that are related to the layout, either by automagically created relations or by manually created relations. Every image shows it's metadata and if the images have a relation to the specific PDF they were used in, the page the image has been used on. Certain metadata—copyright, usage fee and usage rights—can be edited directly in the plugin. By modifying the index.html file of the plugin, you can also change which metadata is visible for each issue or for each image in the report and the way it is displayed on the page. The plugin has a separate .css file to control styling, you can find this in <Plugin>/resources/styles.css.